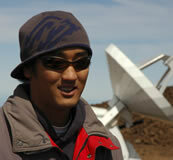 Mark Nishimura was born in Hilo, and graduated from Hilo High School in 2002. He is currently attending California Lutheran University and is majoring in mathematics, with a minor in physics. Mark also plays baseball for CLU. He hopes that this internship will help him decide his future career path. Adaptive optics (AO) systems are used to correct the image distortions caused by turbulence in the earth’s atmosphere. Most AO systems include three main elements: a wave-front sensor, deformable mirror, and control computer. Subaru is in the process of designing a second generation AO system that has a 188 actuator deformable mirror. Using C, a computer simulation of the AO system was created representing a single actuator of the AO system. By manipulating different variables, one can see how they effect the performance of the system. The goal of this project was to find ways of minimizing the temporal error of the AO system by running computer simulations. Improvements such as doubling the amount of wave-front sensor computations and averaging the photon counts to minimize the effects of photon noise have improved the performance of the system.